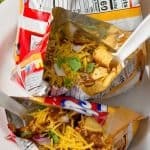 These Walking Tacos are made using a bag of corn chips, chili, cheese and other toppings. They fit perfectly in your hand and are great for all your get-togethers and will be the hit of your summer party! Turn chip bag sideways and cut off about 1/2 inch of the bag. Top chips with chili, cheese and whatever toppings you like.